The name of chef Keiichi Kurobe’s debut solo restaurant is a reference to kurofune, the Japanese term for the first fleet of American ships that landed in Tokyo Bay in the 1850s, opening markets between isolated Edo-era Japan and the West. As expanding trade routes tend to do, the cross-cultural exchange led to a wave of new spices and flavors for both cultures. Even without the history lesson in mind, arriving at Blackship feels like its own voyage of discovery. Housed within a foliage-shrouded bungalow set back from Santa Monica Boulevard, the main dining room is decorated like a modest cottage, with a pair of windows (complete with horizontal blinds) revealing a bustling open kitchen. That’s where you’ll find Kurobe. The former executive sous chef at Hinoki & the Bird grew up between Japan and the U.S.; his cooking career reflects that split, with stints at Luce in San Francisco and a fine-dining European spot in Tokyo. Fittingly, his menu at Blackship is a fusion of Japanese and Italian cooking, a conceit that might seem gimmicky if Kurobe didn’t hide the seams so beautifully. Instead of pork or beef, a hearty bolognese sauce is made with ground hamachi. The fried risotto balls known as arancini, which Kurobe serves with a sweet glaze of reduced shoyu, conceal an oozing egg yolk at their center. 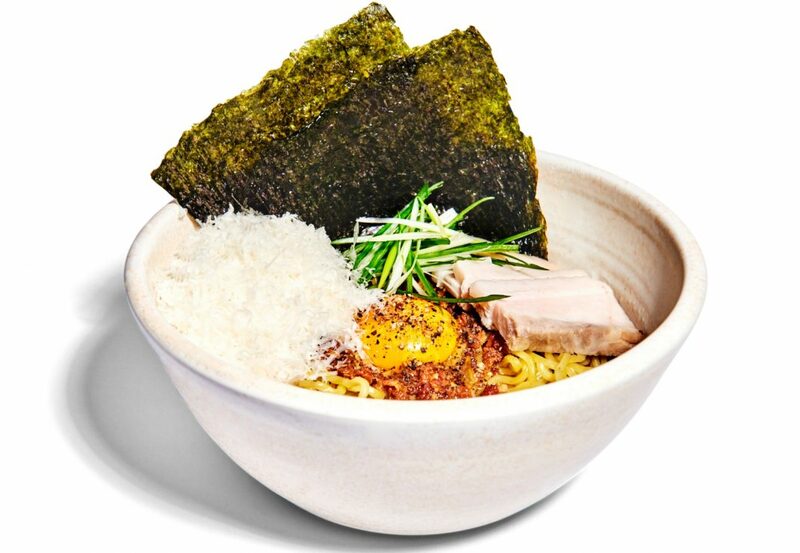 Many dishes seem not only natural in their biculturalism but also downright obvious: namerou, a mound of chopped raw tuna the kitchen minces with ginger and scallions, is lavished with avocado, quail egg, and puffed rice crackers and resembles a supercharged tartare. But the apex of Blackship’s charm is its noodle dishes, which simultaneously feature the bouncy al dente texture prized in cucina Italiana and the umami-rich, dashi-based stocks that anchor Japanese cooking. Faced with a bowl of thin, supple strands bobbing in a smoky broth inspired by carbonara—finished with slabs of pork chashu, black pepper, and a flurry of grated pecorino—you find yourself pondering semantics: Is this ramen or pasta, and does it even matter when it’s this delicious? 8512 Santa Monica Blvd., West Hollywood.